A quick overview of many-to-many relationship in JPA. As compare to unidirectional many-to-many,in bidirectional many-to-many association, both sides will have collections, referencing each other. We have to use @ManyToMany annotation in both entities, on the corresponding collections. From database perceptive there will be no difference, there will still be the same join table with the same columns. 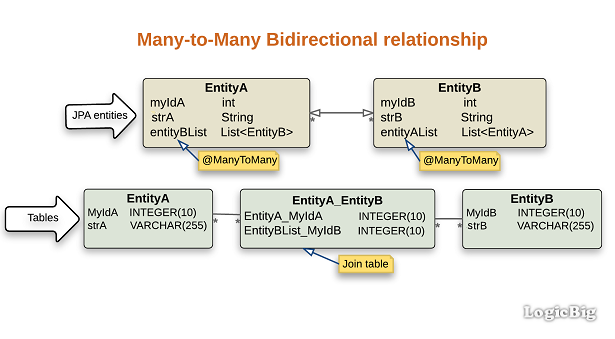 Note that unidirectional vs bidirectional is never a concern of database tables, as we can always use queries in both directions without any additional hint or meta-data, whereas, in JPA world we need additional meta-data to tell the underlying ORM to generate additional reverse queries. h2 1.4.193: H2 Database Engine. hibernate-core 5.2.8.Final: The core O/RM functionality as provided by Hibernate.